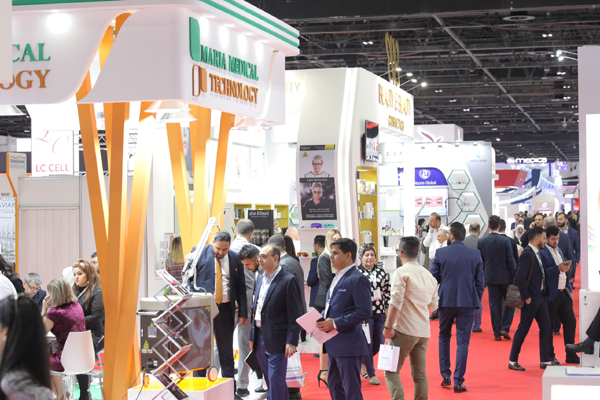 The 19th edition of Dubai World Dermatology and Laser Conference and Exhibition (Dubai Derma) concluded today (March 20) and reported business deals worth over Dh500 million ($136.11 million) being signed at the three-day event. The annual global skincare gathering in Dubai, UAE, was held at the Dubai International Convention and Exhibition Centre (DICEC), and showcased three-days of high-quality scientific sessions and in-depth discussions on a number of issues and topics faced by skin care professionals and industry experts. Running under the theme ‘Skin Health is our Concern’, the event brought together leading skincare specialists, top surgeons and physicians from across various countries under one roof to explore the latest technology advancements and medical treatments for different types of skin diseases. On the sidelines of the conference and exhibition, the scientific committee announced the recommendations for the expo. • All cosmetics and plastic surgeries must be conducted by qualified physicians and specialists. • To raise awareness among the communities about beauty and cosmetics in order not to be fooled by the misconceptions and false information. • Communities and individuals shall be fully aware and shall always refer to the scientific references and resources regarding any medical or cosmetic information and to not take the information provided on the social media platforms for granted. • Arab Academy of Dermatology & Aesthetics (AADA) has become an educational and training institution accredited by the Arab Board of Health Specializations, who has established a new fellowship program – a highly specialised programme in the field of aesthetic dermatology held for a year where the trainees can have courses in different fields like fillers, Botox, laser among others. • To encourage and support the scientific researches related to dermatology in general and to treatments of vitiligo, psoriasis, and eczema in particular. • To exchange experiences and knowledge and increase cooperation in setting the scientific programme between the Arab Academy of Dermatology & Aesthetics and, Dubai Derma, American Academy of Dermatology, and the European Academy of Dermatology and Venerology. • The Arab Academy of Dermatology & Aesthetics in cooperation with some of the scientific institutions and universities will hold training courses not only in Dubai but also in other GCC countries and the Arab world. • Strict supervision shall be imposed on some of the medical centres and no licenses shall be granted without conducting the proper checks and tests and not to rely on those done through the internet. • To encourage medical tourism that focuses on the quality of the treatments provided by medical centres. “The exhibition this year has recorded a great success also by attracting 594 skincare brands from across the globe,” he said. “I hope that the visitors and participants enjoyed the conference agenda and exhibition as well as the rich line up of scientific activities, which were designed to benefit the industry professionals and practitioners,” he added. On the third and final day at the event, skincare specialists and experts discussed a number of topics related to skin health under various sessions such as ‘Lymecycline in the treatment of Acne Vulgaris, Why should leprosy be in the spot light, Systematic Treatment of vitiligo, Trichoscopy as a successful tool in diagnosis and treatment of scalp and hair disorders, Psychological Morbidity and Self Esteem in Patients of Acne Vulgaris, The Art of Medical Photography: A Guide for the Dermatologist and Pyoderma Gangrenosum In Pregnancy: An Uncommon Course and Cosmetic Gynecology, inevitable practice among others. Meanwhile, skincare specialists attending the event highlighted how our skin is a natural reflection of our overall health, where every wrinkle, spot and colour of skin can display a particular illness or sign of a disease and how technology is enabling dermatologists to diagnose and treat skin diseases more effectively than ever before. Among a few recent trends that are changing the face of dermatology include smart algorithms that can diagnose skin cancer within minutes, 3D printers that can produce synthetic skin to fight organ shortages and the ability of dermatologists to reach and consult patients online. Experts further stressed that in order to stay relevant, skin specialists and practitioners should prepare themselves in time for these technology disruptions. Running parallel to the conference, the exhibition offered visitors and participants a great platform to learn about the new technologies in skincare that are useful in diagnosing and treating many serious skin diseases while also offering exhibitors a unique opportunity to interact closely with industry partners, visitors and experts in skin health.